When going for PPC Advertising, it is not enough to just know how it works. You have to arm yourselves with weapons that will make your PPC Marketing a success. Here at Invision Net, we’ll show you the secret recipes to creating an explosive campaign that will boost your conversions and your profits. Your biggest competitors are likely to be doing something right. They have been in the industry longer and they have undoubtedly tried various methods. Before you create your own unique approach, look into what your competitors are doing and try one or two similar ad copies, than test and compare them to your own. Apart from trying something similar to your competitor, you should also exploit their weakness. Which areas are they missing out? If they are trying to attract customers by promoting the features of their product or service, why not try promoting the benefits of you product? On one ad copy you can promote the benefits, on the other, the features. An ad copy is composed of a headline, the ad text body and the display URL. All these parts complete one bigger picture, but each portion has its own influence. If you notice one ad copy working its way to the top, you should not stop split testing. Rather, this should be a sign for you to continue with what you started. Try creating two new ad bodies while using the same headline. Or you can go vice versa and create two new headlines for one ad text body. Try these on for size and see which ones would come out as the champion, then test the parts again. I know, it’s common sense. But to be frank, many people seem to forget this itty bitty detail. 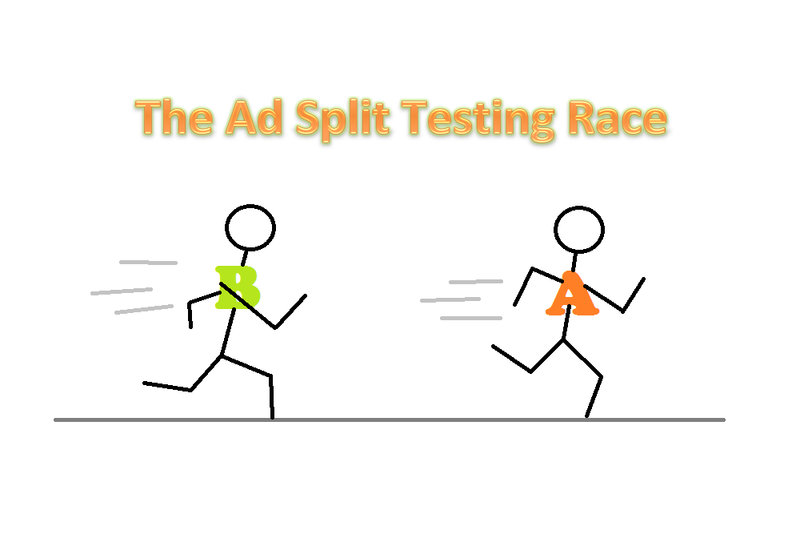 You will not be able to have a conclusive result if the traffic difference between your two ad copies are miles apart. The other ad copy with the fewer traffic might actually produce better results than the other one, except that it’s not getting enough traffic. In Google AdWords, to make sure of this, go to Campaign Advanced Settings, under Ad delivery, choose Rotate Evenly for Ad Rotation. It is very important that you know what your goals are before split testing, just so you won’t lose track. At the very beginning, set your mind that whichever is better in a certain area wins the test. For instance, if you are more interested in driving views to your website, the Click-thru-Rate must be high. If you are more keen in getting conversions, then you should consider the Conversion Rate. Make sure that your goals do not vary halfway thru. Why? Because for a different goal, you must have dropped a well performing ad copy along the way because you measured the test in a different manner. Focus on what your initial goals are, and develop those goals accordingly. PPC Marketing success does not happen overnight. It requires focus on your goals, understanding of the tools, and a wave of magic tricks we call strategies. If you need help in this area, why not give us a call?